The leather belt is approximately 2 1/2" wide with a 3/4" leather strap across the center. This strap is held in place by eight button studs. The studs are positioned in four sets of two and are nickel plated brass. 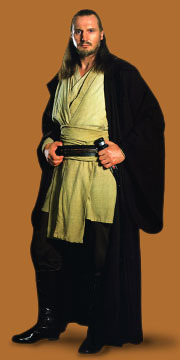 Qui-Gon has two tall pouches on each side of his belt and one wide pouch on the back. These pouches were custom sculpted, cast from resin and then painted to simulate leather. Some of the pouches were probably solid though others were hollowed out and had hinges added so they could be used to store the Jedi's accessories. Covertec belt clips were screwed onto the back of the pouches so they could be easily attached to the belt. 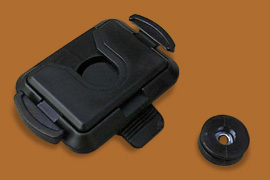 These belt clips are produced by Covertec and used on their palm top computer carrying cases. The tall pouch on his right side holds a comlink and the wide pouch holds the A99 Aquata breather. The tall pouch on his left presumably holds a grappling spike launcher, a device featured in a scene cut from the final film. 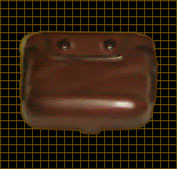 A Covertec belt clip is located on the left side of Jedi's belt. His lightsaber hangs from this clip when not in use. Qui-Gon also carries numerous silver food pellet capsules on his belt, the exact number varies through the course of the film. The usual amount of capsules is 14: six on each side of his right belt pouch, and two just in front of his left pouch - all of them are silver. According to the screenplay, the Jedi gives 5 of these capsules to Shmi Skywalker to provide dinner for the group. Click on blinking indicator to left to find out about other supplies.